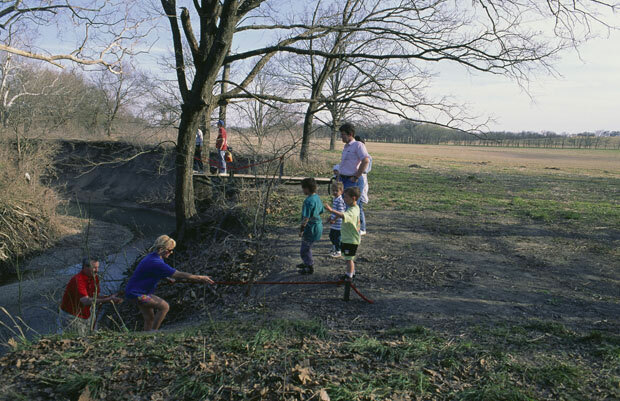 Red Rope Ravine, an environmental sculpture temporarily installed along a section of Rowlett Creek, near Dallas, Texas, at the Connemara Nature Conservancy, consisted of two steel and wooden sculptural “perches” projected from the edge of the creek, which invited participants to experience the creek from an elevated and precarious position. A long red rope dropped into the ravine from the creek edge and enabled people to climb down into the creek bottom. Steel plates with the words ravine, ravish, rapture, and rapt were set in the dry gravel creek bed. These words allude to abstractions of the geologic processes that formed the creek and to our own physical and psychological connections to these natural phenomena.